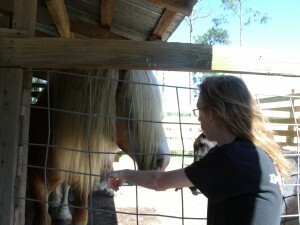 Lancelot comparing manes with Belgian -draft horse. Yes, I am late again. In the past 21 years I have been late, or my plans have had to change a lot. I guess all parents learn pretty quick, that their time is no longer there own. During the days leading up to September 4, I am hope to write about some of the things Lancelot has taught me the past 21 years. Kairos means living in God’s time; it is the eternal now; the appointed time in the purpose of God. I heard Ravi Zacharias teaching on Kairos, and I knew Lancelot and I were living in God’s time. Now most would disagree. After all life is from present to future. (Chronos) My reasoning is Lancelot could die right this second. Death has and will always been a breath away from Lancelot (You and me too, but we do not have physical defects, that should make it impossible to have blood flowing in our bodies). Also in August 1994, Lancelot went to be with Jesus and the animals for several minutes, but after I begged and pleaded, Jesus sent him back to me.